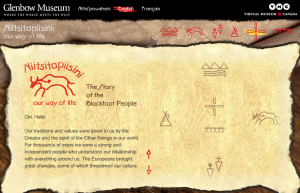 The Blackfoot Digital Library is a repository of digital artifacts pertaining to the Blackfoot peoples. 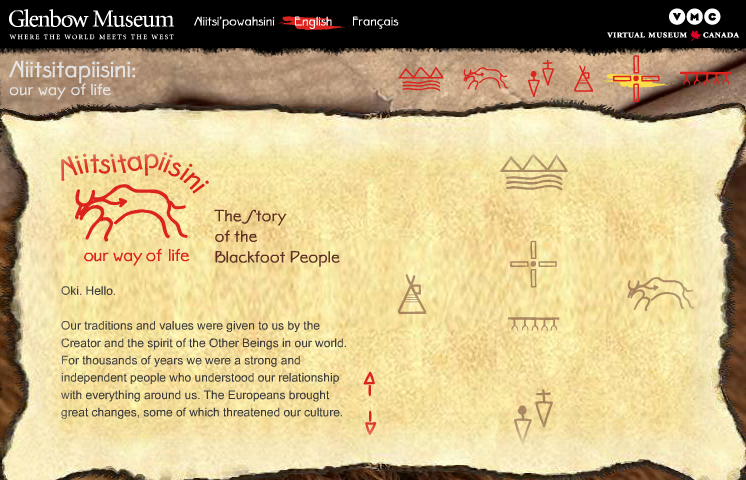 On this website you will find a dictionary of the Blackfoot language both written and spoken. There is also a long but interesting video on the Plains Sign Language that was filmed in 1930 featuring members from many different Plains Nations. The video is completely silent and features a video dictionary of terms from the Plains Sign Language. It is interesting to watch and listen to these languages, however I find it challenging to understand since it is devoid of context. Language and culture are intertwined and to learn the various Blackfoot phrases from a website is merely an act of rote memorization. While a website can be an invaluable aid to preserve First Nations’ languages, I would imagine it is a challenge to actually learn those languages from the website.